TheLunar New Year is on the14th February this year. It is the real beginning of the year. I made a muffler by the slashquilt technique. It involves the following steps. Put the two pieces of cotton sheeting ( bias) on the base cotton. Put the reusing one tie (opened the tie) on these sheeting. Sew four pieces of cloth together by hand with steching parallel lines 7or 8mm in width. Cut the parallel lines on two sheetings and a tie cloth without the base cotton. Wash this in the washing machine. After drying this pile,I made the muffler with one wool tie on the reverse side. (1)stitching parallel lines on a baias to a layer of 3 fablics placed over a base fabric. (2)slashing (cutting) the three layers between the stitching lines. (3)washing to create a pile. The result is a quilt with a velveteen texture. This muffler is warm and the fablic become strong. I also made a bag by the slashquilt technique. This need two reused ties(opened ties). The bottom is 8cm in width using one other tie(not opened). The base cloth is purple in color and made of cotton and two piece of sheeting cotton arelight purple and cream colored. 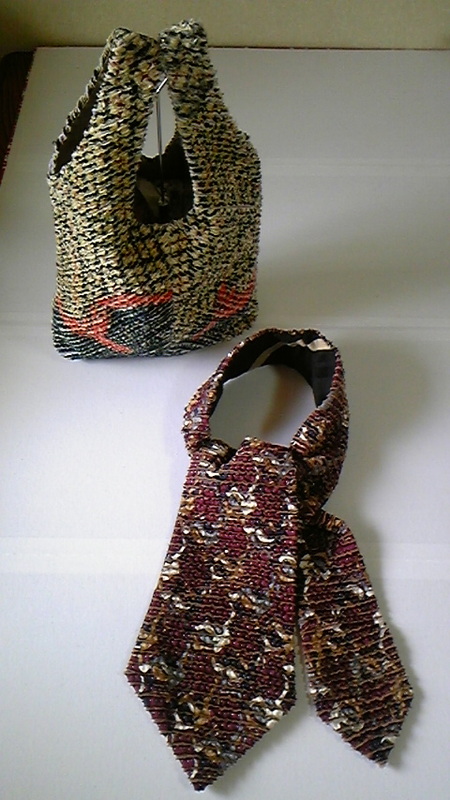 The slashquilt technique is the best way of reusing two or three ties. The article of reusing ties looks uniformity.